Today our blog site opens up for you one of our treasures! Above is page 2 of a small booklet entitled, Information for tourists compiled and edited by C.J. Turner in the 1930s, we believe. C.J. Turner was an enterprising man, today we would perhaps say entrepreneurial. Turner Road, Berowra Heights is named after him. The river is being promoted as a special attraction to lure tourists interested, at that time, in boating, fishing, picnicking and swimming! Berowra for those in more congested suburbs offers its own leisure opportunities and points the way to others further north. The tranquil scene showing the car and pedestrian ferry midstream does indeed evoke the description, Berowra the Beautiful. We are grateful to John Chappell, grandson of C.J.Turner for his donation of the booklet. We do not know how many booklets were circulated. 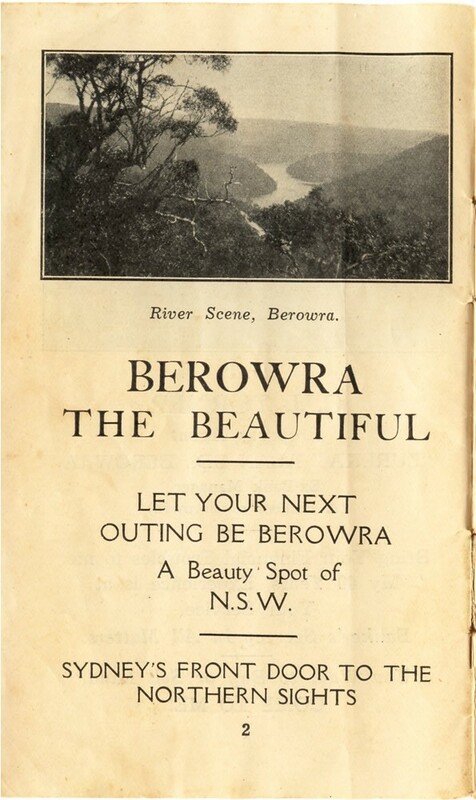 Has your family got one or something related to Berowra Creek/Waters amongst its memorabilia?